Fits a variety of applications. Offers attractive, easy-grip design. Rounded contour for comfort and appearance. Mounting screws included. Bagged. Helps prevent damage to the wall. 3? projection from the wall. Flexible design for safety and ease of cleaning. Bagged. Flexible for safety and ease of cleaning. Spring helps prevent wall damage. 3" projection. Polybagged. Flexible for safety and ease of cleaning. Spring helps prevent wall damage. 3" projection. Polybagged. Standard door strike with adjustable tab. Replaces most residential interior and exterior strikes. Fits all standard doorways. Includes 1 strike and 2 installation screws. Mounts to wall to prevent damage. Easy to install, no fasteners - use wrench to screw into wall. Steel screw with polyethylene body. Visual-pack. Double thumbscrew for sliding doors and windows. Rubber insert helps prevent marring on window frame. Includes 1 lock. High quality rubber bumpers - shoulder on stub supports rubber through entire body for engineered cushioning. Door Opening: 85 degrees - 125 degrees. Rigid doorstop protects interior walls from impact damage by shielding contact point of wall and door knob. Repairs damaged walls. Paintable circular disk used to protect surfaces from door knob damage or cover existing damage. Fits a variety of applications. Offers attractive, easy-grip design. Rounded contour for comfort and appearance. Mounting screws included. Bagged. Rubber wedge used to secure doors. With plastic drywall anchor. Concave rubber. Diameter: 2-7/16". Standard latch strike with 1-5/8" hole centers. Adjustable tab. Replaces most residential interior and exterior strikes. 1-7/16" x 2-1/4". Paintable circular disk used to protect surfaces from door knob damage or cover existing damage. Securely locks patio door in closed or ventilating position by preventing sliding and lifting. 2-3/8"L x 3/16"OD case hardened steel pin locks in retaining ring when engaged, and stores in holder when unlocked. Includes pin with chain, retaining cap, holder, and installation screws. Standard T-strike, used on wood or metal jambs with most grade 2 locksets. Includes 1 strike with (2) #8 x 1" Phillips flat head combination screws. Fits a variety of applications. Offers attractive, easy-grip design. Rounded contour for comfort and appearance. Mounting screws included. Bagged. Fits a variety of applications. Offers attractive, easy-grip design. Rounded contour for comfort and appearance. Mounting screws included. Bagged. Ribbed rubber foot is for positive holding. Replacement tip for National's #238, #239, #1938 and #1939 door stops. Bagged. Plated steel privacy lock. Flip action to lock or unlock, no mortising required. Easy to install. Includes 1 lock and installation screws. Prefix U on factory number denotes new Defender Security packaging. National Hardware Door Stop, Flexible, Light Duty, Spring, Series: V230, 3.62 in Height, Die Cast Zinc, Steel Spring, Plastic Tip, Satin Chrome, 3 in Projection, For used to protect wall from damage 3" projection. 3" projection. 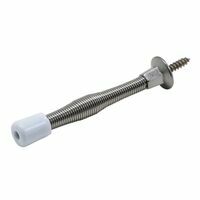 National Hardware Door Stop, Flexible, Spring, Series: MPB232, Steel, Plastic Tip, White, 3 in Projection, For used to protect wall from damage Prevents damage to walls. Wide base stop provides better spring support. Base plate detaches from the spring for easy installation. Steel with rubber bumper. 3" Projection. Visual-pack. Heavy gauge steel mortise hole cover. Used to cover the mortise hole on door edge. Includes 1 plate and 1 set of installation screws.